As the leader of the nonviolent Civil Rights Movement of the 1950s and 1960s, Martin Luther King Jr. traversed the country in his quest for freedom. His involvement in the movement began during the bus boycotts of 1955 and was ended by an assassin's bullet in 1968. King was raised in an activist family. His father was deeply influenced by Marcus Garvey's Back to Africa Movement in the 1920s. His mother was the daughter of one of Atlanta's most influential African American ministers. As a student, King excelled. He easily moved through grade levels and entered Morehouse College, his father's alma mater, at the age of fifteen. Next, he attended Crozer Theological Seminary, where he received a Bachelor of Divinity degree. While he was pursuing his doctorate at Boston University, he met and married Coretta Scott. After receiving his Ph.D. in 1955, King accepted an appointment to the Dexter Street Baptist Church in Montgomery, Alabama. Birmingham, Alabama, police commissioner Bull Connor ordered that fire hoses and dogs be used to subdue protesters. The violence that ensued was broadcast across the nation galvanized the Civil Rights Movement. After his organization of the bus boycott, King formed the Southern Christian Leadership Conference, which dedicated itself to the advancement of rights for African Americans. In April 1963, King organized a protest in Birmingham, Alabama, a city King called "the most thoroughly segregated city in the United States." Since the end of World War II, there had been 60 unsolved bombings of African American churches and homes. Boycotts, sit-ins and marches were conducted. When Bull Connor, head of the Birmingham police department, used fire hoses and dogs on the demonstrators, millions saw the images on television. King was arrested. But support came from around the nation and the world for King and his family. Later in 1963, he delivered his famous "I Have a Dream" speech to thousands in Washington, D.C. In March 1965, Dr. King led protestors on a 50-mile, voting-rights march from Selma to Montgomery, Alabama. It took three attempts for the protestors to complete the march, battling tear gas, cattle prods, and police batons, but the national attention drawn by their efforts ultimately led to the Voting Rights Act of 1965. After the passage of the Civil Rights Act of 1964, King turned his efforts to registering African American voters in the South. In 1965, he led a march in Selma, Alabama, to increase the percentage of African American voters in Alabama. Again, King was arrested. Again, the marchers faced attacks by the police. Tear gas, cattle prods, and billy clubs fell on the peaceful demonstrators. Public opinion weighed predominantly on the side of King and the protesters. Finally, President Johnson ordered the National Guard to protect the demonstrators from attack, and King was able to complete the long march from Selma to the state capital of Montgomery. The action in Selma led to the passage of the Voting Rights Act of 1965. Early in the morning of April 4, 1968, King was shot by James Earl Ray. Spontaneous violence spread through urban areas as mourners unleashed their rage at the loss of their leader. Rioting burst forth in many American cities. The day Martin Luther King Jr. was assassinated, Robert F. Kennedy was campaigning for the presidency in Indianapolis, Indiana. Kennedy made this speech in remembrance of Dr. King's tireless efforts. Click for more on RFK and MLK! But the world never forgot his contributions. Time magazine had named him "Man of the Year" in 1963. In 1964, he won the Nobel Peace Prize and was described as "the first person in the Western world to have shown us that a struggle can be waged without violence." In 1977, he was posthumously awarded the Presidential Medal of Freedom, the highest award a civilian American can earn. In the 1980s, his birthday became a national holiday, creating an annual opportunity for Americans to reflect on the two values he dedicated his life to advancing: equality and nonviolence. 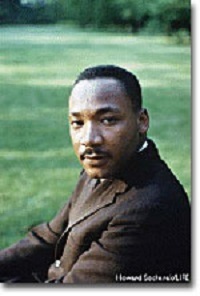 Martin Luther King Jr. was awarded the Nobel Peace Prize in 1964 for his crusade for civil rights in the United States. Read the full text of the presentation speech given by chairman of the Nobel Committee, Gunnar Jahns, then follow the link for a biography of King. The National Voting Rights Museum was founded by survivors of Selma, Alabama's Bloody Sunday to commemorate the long struggle that finally ended in voting rights for African Americans. Here are plenty of pictures from the Civil Rights Movement, as well as newspapers from the era. Listen to a protest song that helped propel the movement through the turbulent and often violent '60s. A thoroughly in-depth and captivating archive of many of Martin Luther King Jr.'s speeches, sermons, and works. This indispensable resource helps visitors better understand one of the great men of the 20th century. Be sure to check out the audio excerpts provided with some of the speeches and sermons.